Many gardeners work with color and shape and water and aroma when creating their outdoor spaces. Consider adding the element of motion by installing a model railway. 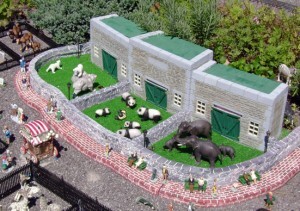 You can get a peek at a garden railway when the Western New York Garden Railway Society opens its exhibit the day after Thanksgiving at the Buffalo and Erie County Botanical Gardens, 2655 South Park Ave., Buffalo. The society has chosen an Old West theme, with adobe buildings and herds of buffalo. 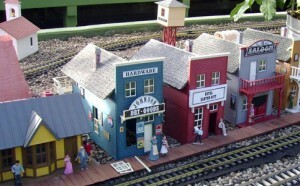 Below left is a town, complete with saloon and dry goods store. Visitors can press buttons to hear sounds of the Old West, including a shoot out. Most garden railway enthusiasts get into the hobby because they like model trains, and being outdoors gives them more room for a layout, said Gary Tebo of West Seneca, secretary of the Western New York Garden Railway Society. The G-scale trains are 1:24, which means that one inch in the model equals 24 inches in the real world. They’re almost four times bigger than the HO model trains you may be more familiar with, and twice as big another popular size, O-gauge. The bigger a train is, the more room it needs to negotiate a curve. Even O-gauge trains are so large that if you try to run them in the house, you would probably find you have only enough room to run them back and forth without being able to set up a loop, Tebo explained. Setting up a railway in your yard also allows you to incorporate real foliage and water elements, which can make the model seem more realistic and add charm. The layouts that members have in their yards can be quite elaborate and detailed. Tebo has 200 feet of track, which doesn’t compare to other members who have 800-900 feet of track, he said. He started with a little L-shaped track around his deck and added a mountain and a water feature. He has enlarged his layout three times. Having a large layout can get pricey. Track costs about $7 per foot. You could pay $1,000 for a single engine, Tebo said, though you can get much cheaper models as well. Buildings can cost $100 new. You want to show people in your layout, and figures can cost $8 or $9 each. A hobbyist might have 400 figures, he said. Tebo estimates that he has spent $10,000 over the years on his layout, but that’s not nearly what others with larger layouts spend. However, there are ways to cut costs. One way is to buy items on sale. Another way to save money is to build your own items from scratch or with a kit. Still another way is to adapt things meant for other purposes for use in the layout. Tebo’s layout includes a band playing music in a gazebo– the gazebo was once a wedding cake topper. A plastic bird feeder shaped like a house is the same size of the other buildings, though if you look closely you’ll see the door is a bit out of scale. 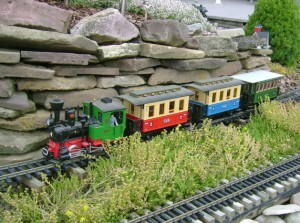 The garden railway exhibit will run from Friday, Nov. 26 to Sunday, Jan. 2. Hours are 10 a.m. to 5 p.m. 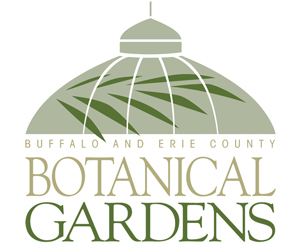 The Botanical Gardens will close at noon on Christmas Eve and be closed Christmas Day. In addition to the railway exhibit, the Holiday Festival at the Botanical Gardens includes a poinsettia show. 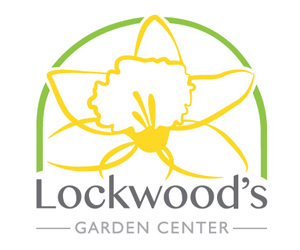 Admission is $8 for adults, $7 for seniors and students, $4 for children 3-12, and free for Botanical Gardens members and children under 3. The members of the Western New York Garden Railway Society are happy to help anyone interested in the hobby. The group, which organized in 2002, meets at Ebenezer United Church of Christ, 630 Main St., West Seneca. Meeting dates are on the society’s web site. Next week, we’ll show you more photos of layouts by the members of the Western New York Garden Railway Society, and discuss plants that work well with garden railways. this is a very nice piece on our club. thank you. your accuracy on reporting things is very good. keep up the good work and if you need more pictures or want to use these pictures for another spread,you can.if anybody says anything, you have David g.downs authorization. Thank you so much for your kind words! I know my readers enjoyed reading about your club. I’m sure many of them weren’t familiar with garden railways, so I appreciate you folks allowing me to share your hobby with them. The photos are great! In our next issue, we’ll follow up with a story on plant suggestions for a garden railway, again illustrated with photos from your club. Thanks again! 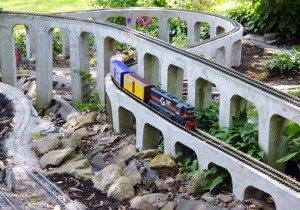 Great article on garden railways and about the Western New York Garden Railway Society. Nice to see our old layout in Elma. We’re building a new one now in Austin, TX. It’s a fun hobby we do together and as part of a club. Makes for good friends. Thanks! We appreciate you sharing your wonderful photos! The layouts are amazing and a lot of fun to see. Best of luck in Texas! 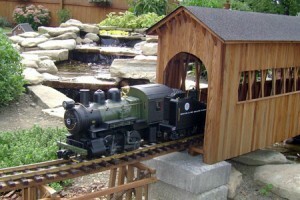 Excellence story about garden railways. The open houses that members have are great. Just to look at the faces of the kids that show up is worth all the work that goes into stetting up a railroad. All we need now is have more young people step forward and take a interest in railroading. Thanks so much for your comment. As an adult, I’m amazed at what you folks do. I’m sure children are simply astounded when they see the layouts. 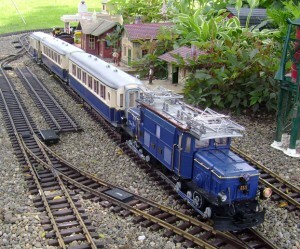 Perhaps these articles will get people interested in garden railways. Thanks for sharing! Thank you for a very nice article on the club activities. My wife says that I am boy that never grew up. When I sit down with my grandson and run the trains, I truly have not grown up, but am back home with my dad and grandfathers, chasing trains, riding the trains, and playing with my Lionel and Marx layout. Never dreamed that at 68, I would just be starting a new layout in the backyard! What a wonderful story! Please consider sending us a photo of your layout for the Your Photos page.